The United Nations (UN) Framework Convention on Climate Change adopted in 1992 made one specific provision which recognized that “all countries, especially developing countries, need access to resources required to achieve sustainable social and economic development and that, in order for developing countries to progress towards that goal, their energy consumption will need to grow taking into account the possibilities for achieving greater energy efficiency and for controlling greenhouse gas emissions in general, including through the application of new technologies on terms which make such an application economically and socially beneficial” (UNFCCC, 2007). Almost 20 years after, in Durban, South Africa, global leaders, policymakers, civil society representatives, and climate change experts convened for the UN Climate Change Conference from November 28 to December 9, 2011. The ultimate decision-making body is the Conference of Parties (COP), allowing for the adoption of COP decisions and resolutions for the practical and effective implementation of the Convention. Major decisions adopted focused on the establishment of an Ad Hoc Working Group on the Durban Platform for Enhanced Action, Launching of the Green Climate Fund, modalities and procedures of the Technology Executive Committee, and national adaptation plans (UNFCCC, 2011). 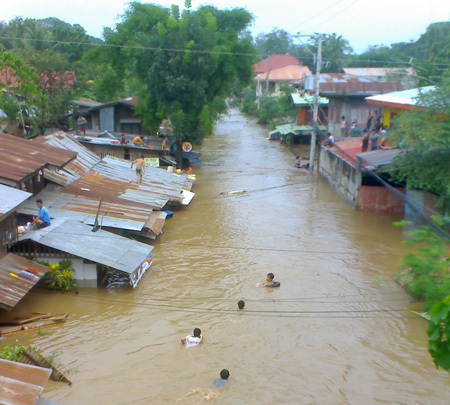 Prior to the Conference, the Philippine government has approved and submitted to the UN a National Climate Change Action Plan (NCCAP) which sought to set priorities such as water governance, improvement of fish yield and administrative changes in the Laguna Lake Development Authority (LLDA), and other climate change adaptation practices (Poblete, 2011). These priorities will allow the national government in preparing proposals to the Green Climate Fund over and above the Adaptation Fund. IBON Foundation (2011) released an assessment of the Durban climate change conference, and claimed that the Durban Package “amounts to more heavy lifting for the South, less obligations for the North, and little help for the poor”. First, the conference has become a mere “platform” for the delegates to present their national statements and not to come up with clear, long term decisions and accountability rules and measures (Black, 2011). Second, the launching of the Green Climate Fund has only increased individual initiatives of each country to develop short term solutions to climate change, undermining possibilities of collaboration with neighbor countries in eliminating climate change risks and not merely working on adaptation. Lastly, the deal for the United States of America (USA), People’s Republic of China (PRC) and India to cut back on their carbon emissions is considered passé and a dramatic way of ending the summit. The end of the Durban Conference seemed more tragic than what it was meaning to generate from the 195 countries which participated in the conference. As Rahman (2011) stated, the Kyoto protocol itself has been much debated especially in terms of each country cutting back carbon emissions by 5% in 1997, and other countries have addressed their reluctance to comply by 2012. Second argument that he raised was that carbon emissions of other countries cannot be reduced as long as rich countries such as the member states of the European Union and China will not take the first move to commit to deeper cuts in the emissions. Lastly, monetary contributions from past agreements were not properly managed (Rahman, 2011). The tragedy that was in Durban was also experienced in the Philippines. Over a thousand deaths in Cagayan de Oro City, Iligan City and other nearby areas in the Mindanao region, in what is a clear result of the lack of empathy from developed countries for poor nations such as the Philippines who are facing the onslaught of climate change. Even with efforts to come up with good strategies and plans of action to mitigate the effects of climate change, a developing nation such as the Philippines with almost 100 million inhabitants can only do so much. Apart from governance issues, national government agencies are attributing the effects of this disaster to climate change. ____________. 2011. Decisions adopted by COP 17 and CMP 17. The Kyoto Protocol is an international climate agreement adopted in 1997 in Kyoto, Japan to cut carbon emissions contributing to global warming.